The earth is a beautiful living planet with major plate tectonic movements that sometimes bring about violent earthquakes. Over a longer period of time, this subduction action (of one plate going below another and the resulting recycling of the crust back into the mantle) also results in the creation of island chains over time. In the case of the Mariana Islands in the Western Pacific, scientists have surmised that they were created with the movement of the Pacific tectonic plate going deep underneath the Philippine plate over earth’s long history. These 15 islands in the archipelago are an ancient terrestrial storyboard. The movement of these plates, have resulted in wondrous and spectacular underwater as well as above water landforms, many of which are volcanoes. Interestingly scientists have determined that Guam, the southernmost island in the archipelago, is the oldest island among them (about 30 million years old, as compared to its northern-most island cousin which is theorized to be only 5 million years old). The Marianas Trench is in close proximity to Guam, with the deepest point of the earth (Challenger Deep) a few hundreds miles southwest of the southern tip of the island. This makes for an even more interesting study, especially for those that call Guam home. What does the existence of the trench, and the movement of the plates mean for this regions fate? Well, scientists have studied this region for many years, and have discovered that while there are earthquakes in this region of the world as a result of these plates colliding, it has been discovered that these plates (at their meeting point) are being lubricated by a mud-like substance that percolates from the sea-floor. They theorize that this in turn reduces the chance for such violent tremors like that being experienced in Japan or the Indonesian region. With that being said, the most memorable Guam earthquake recently on record was in Aug 8, 1993, measuring 8.0 on the Richter scale and lasting about 60 seconds. (I was in this earthquake and I must say this was a whopper. I’ll probably write a blog soon of my experience since this is so fresh in my memory.) While there were no deaths that resulted from it directly, there was significant damage including a major hotel that was recently built and opened for business within the same time period. If scientists are right that the existence of this mud-like lubricant deep within the chasm of the Marianas trench reduces violent earthquakes, this means good news for those that call the islands in the Marianas their home. Over the years, the scientific community has studied many aspects of this part of the world, from the landforms of the Marianas, to the depths of the Marianas Trench and the surrounding areas. My interest to understand my island home and its neighboring island chain, has stirred a desire in me to create an illustration of Guam in context with the world and its place among the other 14 islands within the archipelago. This never-before seen and newly created illustration includes narratives and close-up insets of areas within Guam that are significant to its economy. 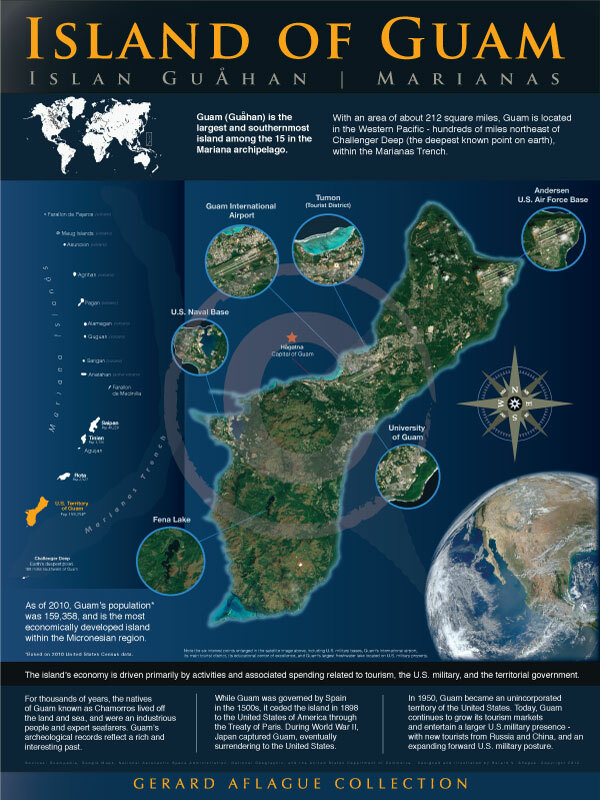 As part of this illustration, I’ve also included a few economic facts that provide for a more interesting and though-provoking study of the island of Guam. To order this illustration in one of many art mediums, click here to be taken to the product page and pay online with a credit card or with a PayPal account.